Union Minister of Commerce and Industry, Suresh Prabhu will address the Start up community by answering questions on Startup India. The objective of the live session is to address concerns and elaborate on the support which they can seek from Startup India. The live session will be held on Wednesday, 16th May at 4.30 pm on Suresh Prabhu’s social handles – Twitter and Facebook, along with Startup India’s social handles – Twitter, Facebook and YouTube. As per Ministry ,Participants need to use the hash tag #AskPrabhu and put their questions across before the live session. Select questions will be answered by Suresh Prabhu. Commerce Minister Suresh Prabhu said that The world is facing serious challenges as the US is taking protectionist measures and India needs to explore ways to boost exports,. He said the US is taking “very strong” measures against all its major trading partners including China. The comments came amid US President Donald Trump imposing USD 60 billion of tariffs on Chinese imports, and also increasing import tariff on steel and aluminium in case of India. Yesterday, President Trump imposed USD 60 billion of tariffs on Chinese imports, a move that could escalate the already tense trade relations between the world’s two biggest economies. The minister further said the government is taking steps to promote shipments. Government and Indian Incis required to work as a team for translating the vision of New India into reality. 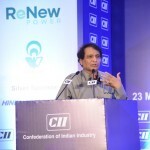 A plan where people and government work together on a single platform has to be put in place with collaborative efforts and shared responsibilities, said Suresh Prabhu, Union Minister for Commerce & Industry, Government of India while addressing the CII Northern Region Annual Conference on New India: Translating Aspirations into Reality at New Delhi, today. Capt Abhimanyu, Minister for Finance, Government of Haryana hailed CII for playing a key role in unleashing competitive and cooperative federalism amongst states and made them realise of their potential and unique advantages. Chandrajit Banerjee, Director General, CII, said that CII would continue to work closely with the Central and state governments in realising Hon’ble Prime Minister’s vision of creating a ‘New India’ by 2022. Prabhu took over the additional charge of Civil Aviation Ministry on Monday. The Directorate General of Civil Aviation (DGCA) has grounded 11 A320 neo planes powered with a certain series of Pratt & Whitney engines following three incidents of mid-air engine failures in less than a month. A total of 14 A320 neo aircraft fitted with a specific series of engines — 11 operated by IndiGo and 3 by GoAir — have now been grounded. Three IndiGo planes were grounded last month. The Union Minister for Commerce & Industry, Shri Suresh Prabhakar Prabhu taking additional charge of the Ministry of Civil Aviation, in New Delhi on March 12, 2018. The Minister of State for Civil Aviation, Shri Jayant Sinha is also seen. The Union Minister for Railways, Shri Suresh Prabhakar Prabhu along with the Union Minister for Health & Family Welfare, Shri J.P. Nadda addressing the media after inaugurating the two additional coaches for Cancer and Family Health Services on the Lifeline Express, the Worlds First Hospital Train, at New Delhi Railway Station on December 08, 2016. Railway Minister Suresh Prabhakar Prabhu, Union Minister of State for Science and Technology Y Satyanarayana Chowdary have been elected unanimously to Rajya Sabha from Andhra Pradesh. Two other candidates T G Venkatesh and V Vijaysai Reddy have also been elected unopposed in the biennial election to the Council of States. Election Returning Officer and AP Legislature Secretary (in charge) K Satyanarayana Rao formally declared the four nominees elected unopposed as the process for withdrawal ended at 3 PM today. V Sunanda Reddy, who filed nomination as a dummy candidate on behalf of the YSR Congress, withdrew her papers yesterday, paving the way for the unanimous election of the four main candidates. Prabhu is a BJP nominee supported by the ruling Telugu Desam Party (TDP). Union Power Minister Piyush Goyal and senior Congress leader and former finance minister P Chidambaram were today elected unopposed to Rajya Sabha from Maharashtra. who had filed their papers for the biennial elections. Chidambaram did not contest the 2014 Lok Sabha polls while his son Karti had unsuccessfully fought from his native Sivaganga constituency in Tamil Nadu. Meanwhile, 10 candidates, including former Maharashtra Chief Minister Narayan Rane, who had filed nomination papers for 10 seats of the Legislative Council, were also elected unopposed as two others withdrew from the fray. Those who pulled out today were Prasad Lad and Manoj Kotak, both from BJP. Punjab Chief Minister Parkash Singh Badal today asked Union Railways Minister Suresh Prabhu to give directions for construction of a subway between Ghanauli and Bari rail stations on the Sirhind Nangal Dam Section to mitigate the hardships faced by locals. The level crossing No. 55-C at village Kharota on NH-205 to Bharatgarh-Kharota Link Road had been closed by the Railways, the Chief Minister wrote in a letter to Prabhu, while urging him that a limited height subway be constructed in its place. Indian Railways Minister Suresh Prabhu today ordered a probe into the accident at Churchgate Station here wherein a local train crashed into the dead end, injuring five passengers and disrupting suburban services on the Western Railway line. Following the incident, Western Railway (WR) had launched an inquiry and suspended motorman L S Tiwari, guard Ajay Gohil and loco inspector M G Verma of the locomotive yesterday. The speeding train, coming from Bhayander, rammed into the dead end on platform number 3 of Churchgate station at about 11.20 AM, as the motorman failed to stop the train in time. As a result, its first coach jumped onto the south-end concourse of the platform. Due to the impact, the wheels of the first coach were seen hanging in the air, ripping apart all the technical equipment in its lower part and also the overhead wire on upper side. According to Shailendra Kumar, Divisional Railway Manager (DRM), Mumbai Division the reason for the motorman not being able to halt the train in time is yet to be ascertained. In order to check whether Tiwari was drunk, a breath analyser test was conducted, which proved negative. However, for further assurance, his blood sample has been collected, the DRM had said. The mangled coach was removed from the track and work to restore services for train operations from platform number 3 were still on.